Pierre-Michel Lasogga heads the ball past Derby keeper Scott Carson to score Leeds United's opening goal. Picture: Tony Johnson. 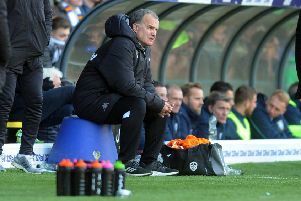 Head coach Paul Heckingbottom told his Leeds United players that they could hold their heads up high after they battled to earn a point from a 2-2 draw at Derby County. Despite being outplayed at times United dug in and managed to get ahead at 2-1 going into injury-time only for Kasey Palmer’s late effort to deny them a victory that would have ended their winless run that goes back to Boxing Day. “I thought we’d weathered the storm. As the game went on and we got the second goal we limited Derby to shots from distance. I was stood there feeling comfortable. “Samu (Saiz) came on when Roofy was injured and the dynamic of the game changed. I thought all the subs did well when they came on - Kalvin was strong in the middle of the park and Gianni (Alioski) scored the goal and did his defensive duties really well as well. “There was bits in there that I could see the players taking on board. Heckingbottom was not happy with every aspect of United’s play.